Enniscrone in Ireland-West is a perfect choice for a great holiday or a fun short break in County Sligo. Find out more about Enniscrone below. 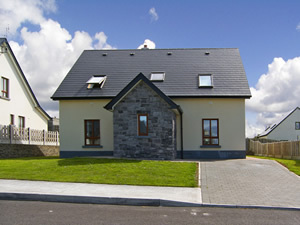 This beautiful home is located in a small development within 10 minutes walk from beautiful Enniscrone. It is the perfect holiday base for families, golfers, surfers and anglers. The property has been awarded the highest possible rating (4 stars) from the Irish Tourist Board, with all mod cons provided. The 3 mile long Blue Flag beach, nearby indoor water park, pitch and putt and other activities provide the fundamentals for keeping the kids happy. The grown-ups will appreciate the golf links course, the chance to fish on the River Moy or unwinding in the famous seaweed baths.Shop. Pub. Restaurant 1 mile. Beach 500 yards. GF: lounge/kitchen/diner, utility room, double, shower room. FF: 2 doubles 1 with ensuite shower room and walk-in wardrobe, twin, bathroom.Electricity included , storage heaters, open fire (no fuel supplied), linen and towels included, travel cot, high chair, stair gate, TV, dvd player, CD, freezer, microwave, dishwasher, w/machine, dryer, hairdryer, uk tv channels, partially enclosed garden, garden furniture, off road parking. Sorry no pets. We have the following details listed regarding Enniscrone accommodation accessibility but we would recommend that you always confirm these prior to booking with the owner or operator. Enniscrone is a great base to explore the wonders of County Sligo and you will find plenty of activities near by. Enniscrone is at Atlantic Coast, County Sligo. Check out the map below for directions, use the controls to zoom in. If you have stayed at Enniscrone why not add your thoughts, comments, pictures to our Facebook page? Don't forget to add the name/town/page link to your comment so its attributed to the correct place. Please keep it polite, we are sensitive souls! Find Cottage Holidays works closely with independent cottage owners and leading holiday travel operators to provide you the widest choice of self catering accommodation across Ireland. Enniscrone in County Sligo is available through: Imagine Ireland.